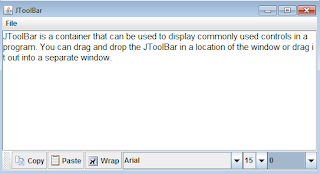 JToolBar is a container that can be used to display commonly used controls in a program. You can drag and drop the JToolBar in a location of the window or drag it out into a separate window. 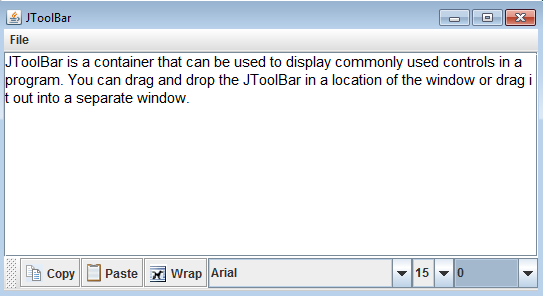 The summary of the JToolBar constructors and useful methods are shown below. creates a horizontal tool bar with the specified name. creates a tool bar with the specified orientation. creates a tool bar with the specified name, and orientation. adds a new JButton to the tool bar. adds a new component to the tool bar. adds the separator to the tool bar to separate its components. allows or does not allow the tool bar to be moved or dragged.